While many Bordeaux Chateaux have long histories in the region, especially in the Medoc, that is not the case with Chateau Gloria. In fact, it’s a relatively new estate in Saint Julien, that when compared with its 1855 Classified Growth peers, was born quite recently. You could say, Chateau Gloria dates back to 1903, but that is not exactly the entire case. The creator of Chateau Gloria, Henri Martin, was born in 1903. Henri Martin had a background in Bordeaux wine before his first birthday. His birth took place at a neighboring St. Julien estate, Chateau Gruaud Larose. As Henri Martin was born on the property, obviously, Henri Martin was destined for a life in wine. Henri Martin certainly came from a wine family background, as his family has roots that date back to 1600’s in Bordeaux! During the war, in 1942, Henri Martin purchased 6 hectares of vines located in the Left Bank in the St. Julien appellation. The vines were previously the property of Chateau Beychevelle. Henri Martin made the purchase on the advice of his friend, Jean-Charles Cazes. 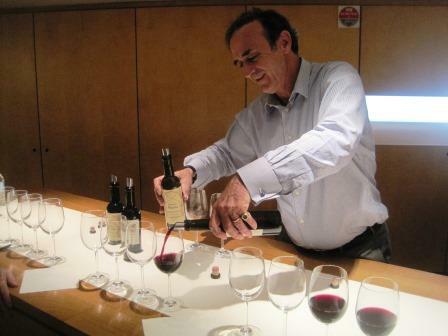 Cazes is the father of Jean Michel Cazes of Chateau Lynch Bages. That early purchase eventually grew into Chateau Gloria. It took time, but eventually they were able to cobble together a total of 48 hectares for the creation of Chateau Gloria. Forty years after he founded Chateau Gloria, Henri Martin purchased his first Classified Growth, Chateau St. Pierre, also located in Saint Julien. Today, Gloria is managed by Jean Louis Triaud who is also responsible for managing their sister estate, Chateau Saint-Pierre. The large, 50 hectare vineyard of Chateau Gloria is planted to 65% Cabernet Sauvignon, 25% Merlot, 5% Petit Verdot and 5% Cabernet Franc. The terroir is gravel, sand and clay soils. The 55 hectares they have in the Left Bank for Chateau Gloria also includes 9 hectares of vines in Pauillac. The chateau is allowed to add those vines into the blend for the wine of Chateau Gloria by a special dispensation. The vineyard of Chateau Gloria can be divided into 3 main sections with vines planted close to Chateau Beychevelle, a parcel located just west of the village and a remaining section of vines is placed not too far from the inland vineyards of Chateau Pichon Lalande. 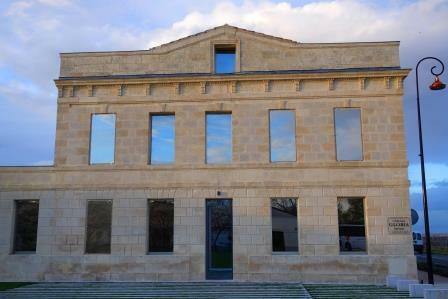 In 2016, Chateau Gloria finished a multi year long, complete renovation of the entire winemaking facilities, vat rooms, cellars, offices, reception areas and tasting tasting room. Due to a long standing arrangement in the appellation, they also produce the wine of Chateau St. Pierre at Gloria. To produce the wine of Chateau Gloria and St. Pierre the grapes are vinified in 76 different stainless steel tanks that range in size from 50 hectoliters up to 178 hectoliters. Malolactic fermentation takes place in barrel. Chateau Gloria is aged in 40% new, French oak barrels for 14 months. On average, the production is close to 20,000 cases of Chateau Gloria per year. There is a second wine, Peymartin. The best vintages of Chateau Gloria are: 2018, 2017, 2016, 2015, 2014, 2010, 2009, 2005, 2000 and 1982. Jean Louis Triaud is also in charge of the other family estates. Aside from the classified growth, Chateau St. Pierre, which we already mentioned, they also produce the following wines; Bel Air from Haut Medoc, Pey Martin from St. Julien and Haut Beychevelle Gloria. Chateau Haut Beychevelle Gloria, located in the Saint Julien appellation shares owners and utilizes the same technical team as Chateau Gloria. But it is a completely different wine. Haut Beychevelle Gloria comes from a 5 hectare parcel of vines located in the middle of Beychevelle and Gloria with a similar gravel terroir. Chateau Haut Beychevelle Gloria is planted to 65% Cabernet Sauvignon, 10% Cabernet Franc and 25% Merlot. The vines are on average, 30 years of age. The wine is vinified in stainless steel tanks. Malolactic fermentation takes place in vat. Chateau Haut Beychevelle Gloria is aged in 35% new, French oak barrels for 12 months before bottling. The production of Haut Beychevelle Gloria is on average slightly more than 2,000 cases per vintage. Chateau Gloria is a lighter, elegant style of Saint Julien that is often ready to drink within a few years of release. Yet don’t let that fool you. The wine can also age quite well. The 2009 was the best wine made at this Medoc estate I have ever tasted until the 2010 Gloria was produced until the 2014 was produced, which might be even better! Chateau Gloria is popular Bordeaux wine with consumers for its early drinkability, charming character and fair prices. It’s a contender for the best Bordeaux value wine from the St. Julien appellation. Chateau Gloria can be enjoyed young, with decanting. Young vintages can be decanted for an average of 1-2 hours, give or take. This allows the wine to soften and open its perfume. Older vintages might need very little decanting, just enough to remove the sediment. Chateau Gloria is usually better with at least 5-8 years of bottle age. Of course that can vary slightly, depending on the vintage character. Chateau Gloria offers its best drinking and should reach peak maturity between 8-17 years of age after the vintage. Chateau Gloria is best served at 15.5 degrees Celsius, 60 degrees Fahrenheit. The cool, almost cellar temperature gives the wine more freshness and lift. Chateau Gloria is best served with all types of classic meat dishes, veal, pork, beef, lamb, duck, game, roast chicken, roasted, braised and grilled dishes. Chateau Gloria is a perfect match with Asian dishes, hearty fish courses like tuna, salmon, mushrooms and pasta as well as cheese. Espresso bean, cassis, licorice, tobacco and dark cherry fruits are easily available here. The wine is medium bodied, soft, and will be easy to enjoy in its youth. The wine was made from a blend of 61% Cabernet Sauvignon, 26% Merlot 8% Petit Verdot and 5% Cabernet Franc. Forward, fresh and refined, the deep red fruits, espresso, wet earth and spice combine to produce an outstanding wine of character and charm. This is clearly in contention to end up as the finest vintage Gloria has ever produced. Exotic tobacco, anisette and fresh-picked currants on the nose. On the palate, the wine is well coiffed and fresh. The fruit is clean and pure and the perfume lingers in your brain. This is clearly the best wine ever from Gloria. The wine was made from a blend of 60% Cabernet Sauvignon, 30% Merlot 7% Cabernet Franc and 3% Petit Verdot. This is just a terrific wine and value. Elegant, refined, fresh, lively, and with an earthy, ripe, dark, red berry character that grows and expands in the glass and on your palate. Medium/full bodied, this will be just great with 5 years or so in the bottle. Elegant, polished, fresh, medium bodied with a really nice character to all its sweet, black and dark red fruits. Medium bodied, fresh and refined, there is a marked, energetic, red berry quality to the wine that allows it to deliver a bright, elegant, fresh, cherry and cassis note that really sings. This is a contender for the best value in a top Left Bank for 2014. With a touch of oak, licorice and black cherry, this medium bodied, forward, freshly styled wine, finishes with red plums and a hint of cranberry. Forward and open in style, with soft tannins, medium body and good freshness to the ripe, dark, red fruits. The wine was produced from a blend of 63% Cabernet Sauvignon, 27% Merlot, 5% Cabernet Franc and 5% Petit Verdot. This is really quite strong for the vintage. Open and forward, this medium bodied, dark cherry, licorice and mocha profile is made even better with the soft, dark red fruits in the finish. With ample ripe blackberry, chocolate, spice and espresso, this tannic, powerful vintage of Gloria is built to age and evolve. It has the depth and structure to improve for years. From a blend of 66% Cabernet Sauvignon, 28% Merlot and 6% Petit Verdot, this is one of the best buys from St. Julien in this vintage. Medium.full bodied with fresh blackberry, chocolate and cherry scents, this supple textured, ripe, sweet wine will compete with many classified growths in a blind tasting. At just under $40, this blend of 61% Cabernet Sauvignon, 27% Merlot, 6% Cabernet Franc and 6% Petit Verdot is a Bordeaux wine worth buying. Ready to go, this medium bodied, elegant charmer hits the spot with its soft, pure, earthy, spicy red fruit character. You can enjoy this now, and over the next decade and probably for at least a few more years after that. Medium bodied, easy drinking, fully mature wine showing equal amounts of secondary, earth, tobacco and forest aromatics as red fruit, this requires drinking over the next 3-5 years. Tobacco, cocoa, wet earth, mushroom and thyme aromas show a wine that is developing nicely. On the palate, the wine is medium bodied, soft, fresh and offering a melange of blackberry and plums in the endnote. You can drink this now, or give it a few more years for more complexity. This finesse styled wine has gotten much better over the past years. Tobacco, earth and black cherries are in the forefront, followed by soft, delicate textures and a spicy, fresh, red berry finish. Showing light ruby with bricking in the color, the earthy, tobacco and cedar chest nose, with its medium bodied, soft, red berry finish is clearly in a good place today. However, a few more years could help soften the tannins and bring out a bit more in the nose. With a perfume of blackberries, tobacco, herbs, cassis and black cherry, this medium/full bodied St. Julien is already showing well. A few more years and this should be at perfection. Medium bodied with a bit too much oak, the black raspberry and crisp, red plum and leafy profile are serving up all it has to offer. I’d opt for drinking this sooner than later. Medium bodied, with good freshness, but lacking in concentration, this dark, red berry focused wine is a wine that is best enjoyed in its youth. This charming, developed, medium bodied, soft, earthy, forest floor, kirsch and tobacco filled wine is ready for prime time drinking. Medium bodied, elegantly styled, with a fresh, cherry and earthy character, the tobacco and cigar box notes add a lot to the wine. Fully mature, this is ready to go. If you're looking for power, find another wine. This is about finesse, elegance and current drinkability. The nose offers tobacco, black cherry and earthy scents. The palate is refined, soft and already serving the goods. It's probably not going to make it to old age, but there is no rush to drink this before it hits 20. Better on the nose, with its spicy, tobacco laden perfume, than on the medium bodied, red berry, bright palate, as the fruit has clearly started fading. Drink up. Well past its prime, the wine has lost much of its fruit and is showing mostly, secondary characteristics, with more acidity than fruit on the palate. Not much fun to drink. If you're holding any remaining bottles, I'd finish them sooner than later as this is not going to get better, and will jjjust continue losing fruit. I was surprised how well this small wine was showing at the ripe old age of 30. The earthy, herbal, forest, tobacco, cedar and cassis. medium body and soft textures made this a lot of fun to drink. I would not hold it for further aging as there is not enough stuffing to allow the age much further.